A group of film directors, film cast members and family members attend the Toe Tagged: A Short Horror Film Festival on Saturday at the Border Theater in Mission. MISSION — Demons and serial killers were some of the main characters displayed in the short horror films shown Saturday at Border Theater. Edinburg native Jose “Joey” Olmeda, founder and event organizer, said the screening is to showcase films and give exposure and recognition to local filmmakers. The collaboration began during the spring when Olmeda posted on social media asking filmmakers to submit videos to his page because he wanted to have an outlet for independent directors in the Rio Grande Valley to showcase their films. The news quickly spread to local directors like Joe Rios and Abel Gonzalez and they submitted a film. During the submission period, Olmeda also received an unexpected surprise phone call from PSJA Teacher, Frank Zepeda who said that his daughter Manelly wanted to participate. 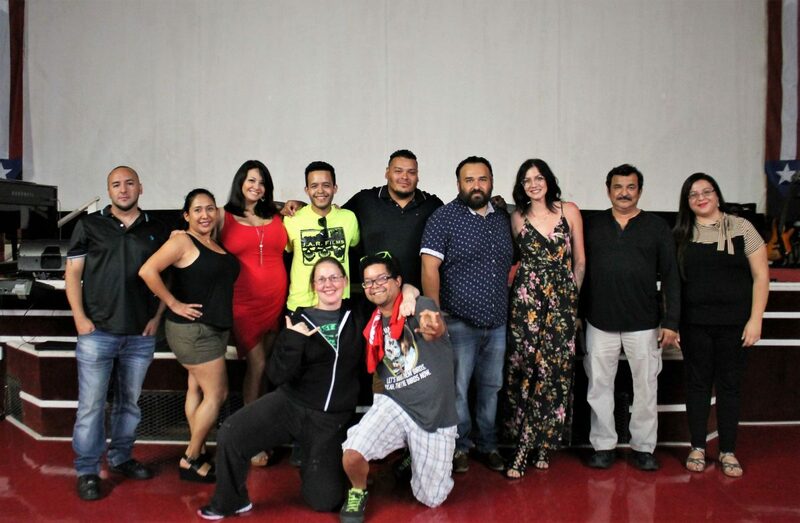 “Toe Tagged: A Short Horror Film Festival” was a collaborative effort of short horror films made by independent filmmakers from the Rio Grande Valley in conjunction with others from across the state and shown to an audience of about 30. Olmeda, who has his own production company called “J.A.R.” films, which he began in 2014, showed three films. Another independent director, Edinburg native, Quint Rogers, showcased his film, “Serial Killer,” which included suspense and laughter. Stephanie Baggett, one of the stars of the short film, said it wounded up being really funny for a comedy. Baggett, who has done other short films, said it was through a mutual friend that got her in contact with Rogers and when they met, she felt comfortable after reading the script and decided to play the character. The film was shot in five hours and filmed in his aunt’s home, Rogers said.